What if we all Learned the Kindergarten Way? In preparation for starting my masters next week, I have an extensive list of “pre-readings” to complete by Monday. I starting reading a couple of them today, and was thoroughly intrigued by one article in particular, All I Really Need to Know (About Creative Thinking) I Learned (By Studying How Children Learn) in Kindergarten by Mitchel Resnick. It’s a brilliant article, and if you haven’t read it before, I highly recommend that you do, but regardless I thought I’d summarize it here. 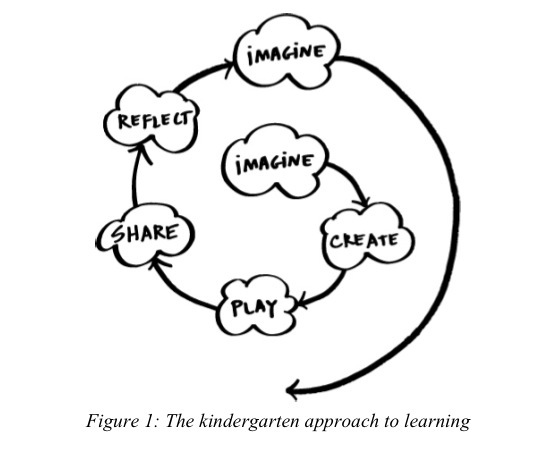 Resnick argues that we need to make the rest of our schools just like the experience in kindergarten, whereby students move fluidly through the process of imagination, creation, play, sharing, and reflecting, and repeating several times over. This allows students to become creative thinkers who can develop essential skills to learn more advanced and complex concepts. 1) Imagine – In kindergarten, children are surrounding by materials that allow their imagination to take hold; blocks, colour utensils, toys. They do not limit their thinking, but allow it to be endless and personal. Today, using educational technologies allows for this as well, providing it not does limit creativity, like tutoring software could. Renick states, “Our goal is to provide tools that can be used in multiple ways, leaving more room for children’s imagination.” We need to support creativity and diversity in order to allow children to use their imagination. 2) Create – In order for students to be creative thinkers, we need to give them chances and time to be creative. Providing them with electronics, toys, or learning tasks that do not give them the chance to create or design is a disservice to them. Again, it limits them and their creativity. 3) Play – Just like us teachers need our own time to relax and do what we love most, students do as well. Giving students time to play allows for exploration and experimentation. Renick uses Scratch as a good example of what this could look like in the classroom. 4) Share – Having the ability to share and collaborate is a skill that is becoming more desirable for the work force. This is a life-long skill and students need to be given ample opportunities in the classroom environment to work with others and discover the ways in which collaboration and sharing can be successful. 5) Reflect – I have noticed that with genius hour and ideas like it, that recently reflection has become a critical piece to learning. Giving kids the time to think about what they did, what worked and what didn’t, and how they changed their design/thinking is an incredible tool to use to emphasize reflection. It’s hard to grasp an understanding of learning and failures without it. Throughout this article, I could envision what this would look like in the ideal classroom, and even in my classroom now, the aspects I am already incorporating into my daily teaching. I guess I’m left to wonder, is it 100% attainable? Yes, this would be the way I would want to teach and allow my students ample opportunities to be creators of their own learning, but with an ever so tight curriculum to cover, where is the balance? How can I ensure my students are given enough time to experience this cyclical structure, without disregarding the curriculum I must teach? This entry was posted in Approaches to Teaching and Learning, Career Long Learners, Environments Conducive to Student Learning and tagged collaborate, creative thinkers, Mitchel Resnick, Scratch by ekpetley. Bookmark the permalink. Thank you for sharing this link with me. I’d love to see how this model actually works in practice! Erin, I’m also a big proponent of Sudbury schooling, having worked at these schools since 1998. I agree with Mike that Sudbury students of all ages (with free age-mixing) imagine, create, play, share, and reflect all the time–because we get out of their way and let these natural human tendencies flourish. I sometimes think of myself as an anthropologist of childhood, and I’ve often described our school’s laws (made and enforced by students and staff together) as the “everything I need to know I learned in kindergarten” type: don’t bother other people, clean up after yourself, etc. Fully self-directed learning in mixed-age, democratically run schools enables the most incredible learning and growth. In addition to Sudbury Valley School’s rich website, I invite you to check out my blog at http://writelearning.wordpress.com and my school’s website at http://alpinevalleyschool.com. Wow, the Sudbury schooling sounds very interesting indeed. Thanks for the comments and for sharing your blog and school website. I’m looking forward to reading up on them.